Santorini is a Cycladic island in the Aegean Sea, off the coast of Greece. 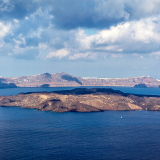 A volcanic eruption in the 16th century BC left the island destructed, with cliffs along the caldera sinking beneath the sea. 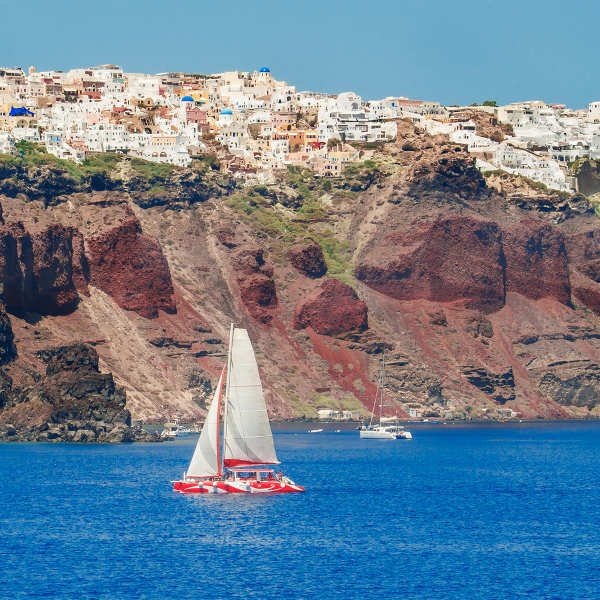 The main towns of Oia and Fira are popular tourist destinations with their picturesque, white-washed houses overlooking the sea and surrounding islands. 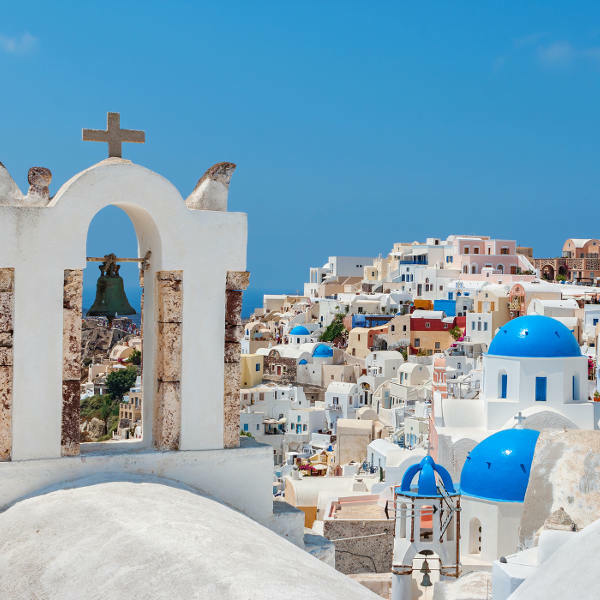 Cheap flights to Santorini are now available for a limited time only, so book your flight today and experience the idyllic beauty and tranquil scenery this paradise island has to offer. Santorini is home to Santorini National Airport (JTR), a 5 minute drive from the island’s centre. 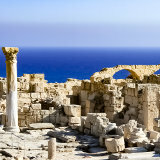 Walk through the ruins of the Byzantine Castle and visit the old relics of Ancient Thera, conquered by the Spartans, to appreciate the colonial influences that once dominated the island. The volcanic black beaches are a highlight of Santorini and you’ll find great swimming spots in Amoudi Bay. Perissa Beach is the perfect spot to watch the sunset over the island. Make some waves with sailing tours and sunset cruises along the crystal waters. Enjoy some snorkelling at Red Beach and marvel at the marine life living around the island. The ideal time to visit Santorini is between late April and early November when the weather is warm and there is hardly any rain. The months between June and September provide the best conditions for swimming, sunbathing and maximising the nightlife. The island can get rather hot, so for a more comfortable sightseeing experience go between April and June, or September and November. Santorini is one of the oldest Cycladic islands in the Aegean Sea and is a favourite holiday destination for many tourists. After one of the biggest volcanic eruptions in history took place, the island remained, although many of the colourful cliffs lining the caldera have sunk beneath the sea. White Cycladic houses hug the cliff-tops, spilling down the steep, terraced rock, creating a picturesque impression of ancient Greece. In amongst the sun-drenched buildings, you’ll find some of Greece’s best wining, dining and nightlife attractions, making for indulgent beach-days and heady nights. The white-washed buildings and surrounding volcanoes create an idyllic landscape, leaving you overwhelmed by its beauty. The island offers many activities, from exploring historic sites in Akrotiri to indulging in the water sports in Kamari. As you stroll through the towns, you’ll find many restaurants and cafés serving up delicious local treats and the freshest seafood. Compare several airlines, and book your cheap flights to Santorini online at Travelstart. This is one of the safest holiday destinations and crime is generally unheard of. Take the usual precautions of guarding your valuables when walking along the streets or on the beach. Be aware of scams carried out by rental agencies, tour operators and taxi drivers. Should there be an issue involving local police, interpreters are usually available. All water on the island is bottled, although tap water is fine for showering and teeth-brushing. Thira Town has a good hospital and excellent clinics while larger towns, like Oia and Kamari, have suitable outpatient services. Fira is the largest town and is where all the action happens. Just ten minutes away, Firostafani is less crowded but just as vibey! For the best sunset views and a relaxed atmosphere, Imerovigli is a good choice. For a romantic retreat, Oia is lovely. The beaches are situated along the east of the island, a 20 minute drive from the main towns. The beach towns are cheaper, less busy and have an authentic ‘Greek’ feel to them. Travelling around the island of Santorini is really easy and convenient. You can choose between renting a car, driving a scooter or taking the bus. Of course, there’s no real need to drive around as you’ll want to appreciate the beauty of the towns by walking through the streets. Many tourists opt for a scooter as it’s more convenient and you can zip between towns with the wind blowing through your hair. The bus system is very cheap and efficient as it reaches all the major tourist attractions; however, buses stop running after midnight so if you’re partying till late, you’ll need to get a taxi back to your hotel.